A one per cent fuel rebate announced by BC Ferries will ease new fare increases that take effect April 1. On major routes between Metro Vancouver and Vancouver Island, it means the approved 3.9 per cent fare increases will mean a 2.9 per cent net increase. Walk-on passengers will pay $16.70, up from $16.25 now. BC Ferries president Mike Corrigan said the fuel hedges they have in place should ensure the rebate remains in place at least through the summer months and possibly into next year. He said the fare increases are directly linked to increased operating costs and capital replacements, while any fuel surcharges or rebates flow from fuel deferral accounts. A previous 3.4 per cent fuel surcharge was eliminated in mid-December as fuel prices fell. Fuel surcharges and rebates don’t apply on northern routes, where fares rise an average of two per cent. The B.C. 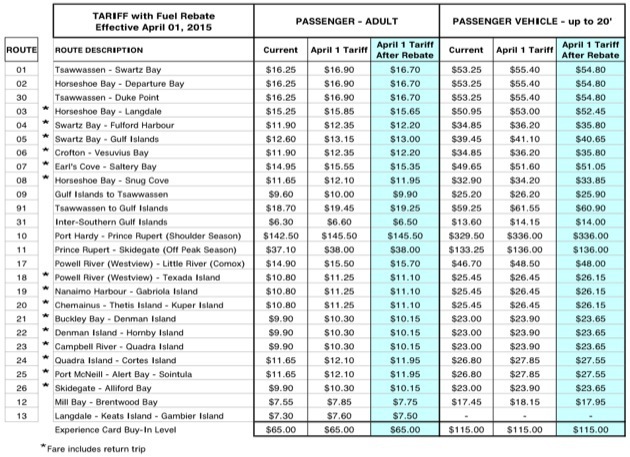 Ferries Commissioner this month indicated fare increases will be capped at a maximum of 1.9 per cent in subsequent years, from 2016 to 2020.